Welcome to Chiang Mai Mail Daily Horoscope! 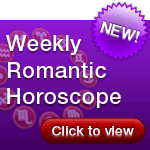 Now with Weekly Romantic Horoscope Video! Select a Sign below and find out what our Astrologer Patrick Arundell has to say about your Horoscope.